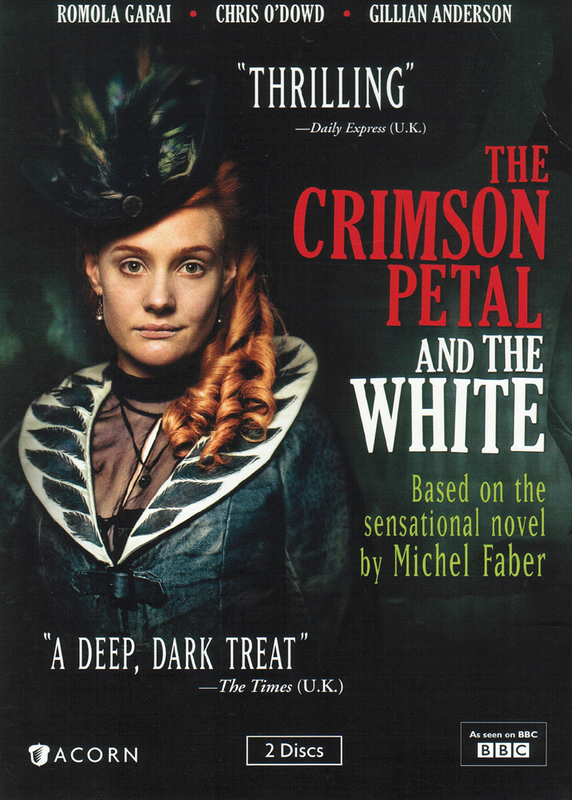 Not having the read the novel by Michel Faber from which this British television mini-series -- THE CRIMSON PETAL AND THE WHITE -- has been adapted, I will not ask you to skip the adaptation and read the novel, as did The New York Times critic who reviewed the mini series when it was first shown on American TV a week or so back. No doubt the novel was better than its filmed version. (When are they not, with the exception of John Fowles' The Magus?) 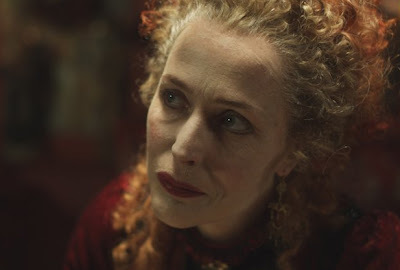 I will only suggest that if you want to see a most unusual tale, filmed darkly and beautifully, well- (and in one major instance, surprisingly-) cast and acted, feminist and anti-class to its core yet strangely elusive, too, then take a chance on this story of 1870s London and its bordellos, bourgeoisie and bonhommie (the latter among men, at least; the women here are not so lucky). Adapted by Lucinda Coxon and directed by Marc Munden, this story of a prostitute named Sugar who is determined to better her station in life and perhaps wreak revenge on the males who have tampered and toyed with her, the 244-minute, four-part series begins with Sugar visiting a prostie friend who's been beaten to near death by two clients. The dank, ugly ambiance, shown in brief, deft strokes, coupled with the utter sadness of this scene grabs us immediately and lets us know that we are in territory imagined with a good grip on reality. 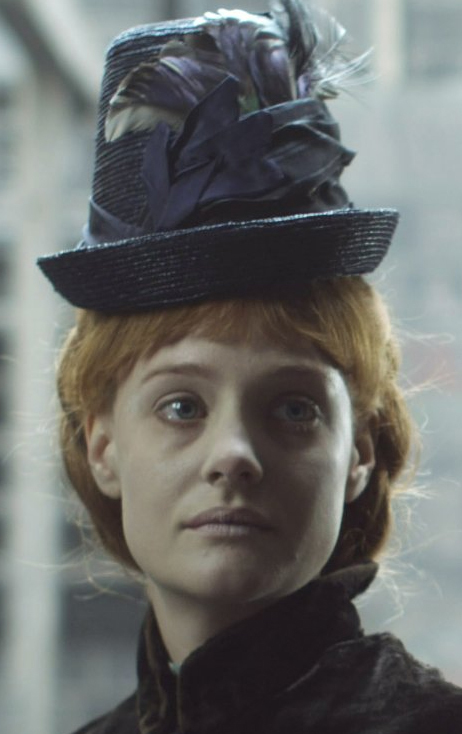 Sugar is played by that excellent and increasingly versatile actress Romola Garai, above, and she is by turns lovely, frightening and exquisite. She keeps a part of Sugar's character from us, and this is all to the good, since she also learns about herself and about life as she moves along. Garai is expectedly excellent, but the performance by the fellow who plays her would-be savior and symbolic/literal "Sugar" daddy, William Rackham, is anything but expected. 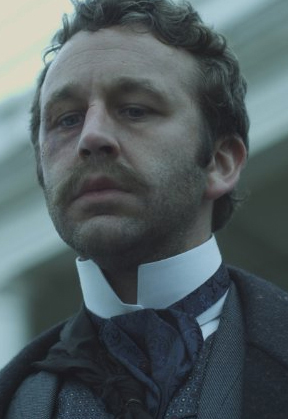 Rackham is played by Chris O'Dowd. Yes, the numbskull from The IT Crowd who has lately appeared in U.S. films from Gulliver's Travels to Bridesmaids to Friends With Kids. O'Dowd is a terrific comedian, with a special kind of denseness that is securely his own. That this same denseness would travel from comedy to drama and the tragedy of senseless class distinctions is somewhat of a shock. How did they have the idea to cast this actor, and he to go for broke with all cylinders burning? However, it happened, O'Dowd is simply astounding in this role -- which should open up all sorts of new possibilities for his career. Also excellent are Amanda Hale as Rackham's unstable wife (at left) and Gillian Anderson, below, as Sugar' madame-and-more. Every role -- including those played by Richard E. Grant and Shirley Henderson -- is cast with enormous smarts and delivered with conviction and style. 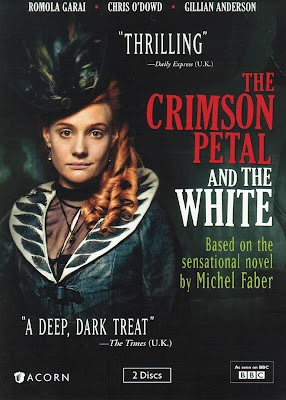 The Crimson Petal and The White, from Acorn Media -- the company currently giving us the best in British -- is available tomorrow, Tuesday, September 25, on DVD in a two-disc set, with 16:9 widescreen format and SDH subtitles, for sale or rental. Extras include deleted scenes, interviews with cast, director, and key crew, and character biographies.